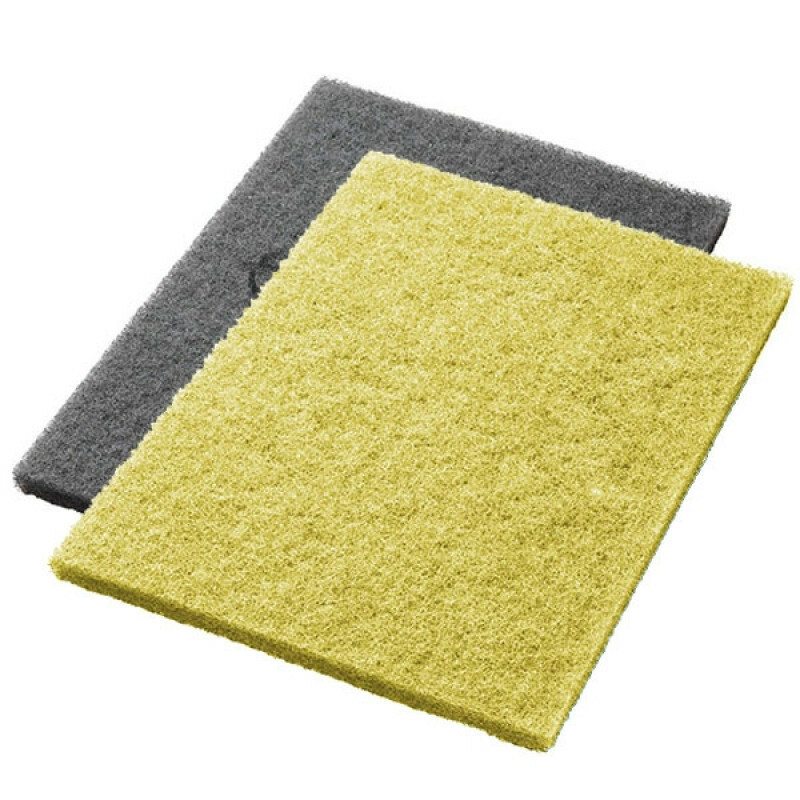 Available in sizes 4.5" x 10", 14" x 20", 14" x 28", and 14" x 32"
This rectangular yellow pad that starts the polishing step in the restoration process when using Twister’s series of pads. When used, pad brings out the initial luster of your floor’s surface. This step prepares the floor for the final polishing from our green 3000 grit Twister pad which puts the final high gloss on your surface. Our white and red should be used before using this yellow pad to remove and existing scratches and stains. Twister have made it a point to reduce waste and save you money with these pads. The billions of micro diamonds allow the pads to be used with no chemicals, reducing the need to buy and carry chemicals to your work place. These special diamond infused pads also will clean and polish your floor simultaneously to save you time and adding to your bottom line savings. The pads are also made to mechanically densify your floor so they will resist wear, dirt, and slipping which will ultimately create safer floors in for you and others. Twister Pads should be replaced when the backing starts to show, but the life span of these pads to be 3 times longer that of traditional pads. A wide range of floors can be used with these pads, including vinyl, concrete, terrazzo, marble, rubber, and many other types of flooring. These yellow Twister pads are as simple as normal pads to attach to your machine and require no additional equipment. Water may be needed for your pads depending on the speed of your machine and the type of pad, so please use our Twister pad guide for tips on when and where to use each type of pad. If you own a round buffer or scrubber, look to our round Twister yellow pads. No chemicals need for cleaning which makes these pads cleaner and safer. Scrubbing should be used with water only. Built with billions of microscopic diamonds that clean and polish the floor, all at the same time. Daily use of Twister pads can provide your floors with a glossy, mechanically densified surface with increased resistance to dirt and wear. Pads fit current machines on the market without need for new equipment. Life span of the Twister daily cleaning pad is also three times that of a traditional floor cleaning pad. 137532 - 4.5" x 10"
137533 - 14" x 20"
137534 - 14" x 28"
137535 - 14" x 32"
Customers who were interested in the Yellow Twister™ Diamond Concrete Prep Pads - 1500 Grit (Rectangular) - Case of 2 were also interested in the following items. This is a review for the Yellow Twister™ Diamond Concrete Prep Pads - 1500 Grit (Rectangular) - Case of 2.